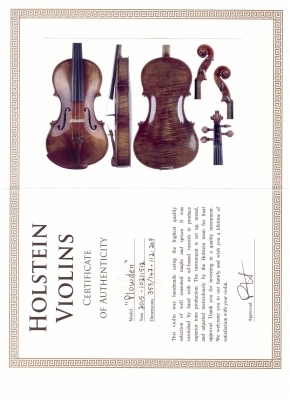 I'm totally excited to say that yesterday, I received my Holstein Plowden violin. WOW! What an instrument! I totally understand why Pierre is so excited about this maker. First off, the oil varnish on the instrument is absolutely stunning; undoubtedly the best I've ever seen with my own eyes. Then there's the sound .... F**ING BLOWN AWAY! The tone this violin has is unlike anything I've played to date: excellent balance between dark and power, with a wonderful mid-range. This is quite different from the Ming Jiang Zhu 909, which was a lot brighter, more projecting of a sound. However, where the Plowden really set itself apart is the effort (or lack thereof). No need for much bow to get the violin singing, which is always something a professional violinist looks for, even before the sound. I am forever thankful to Mike & Pierre for giving me the opportunity to own a true gem of a violin at an affordable price. The only request I have is for them to pass my personal thanks back to the maker. I look forward to recording some music with it in my brother's memory. 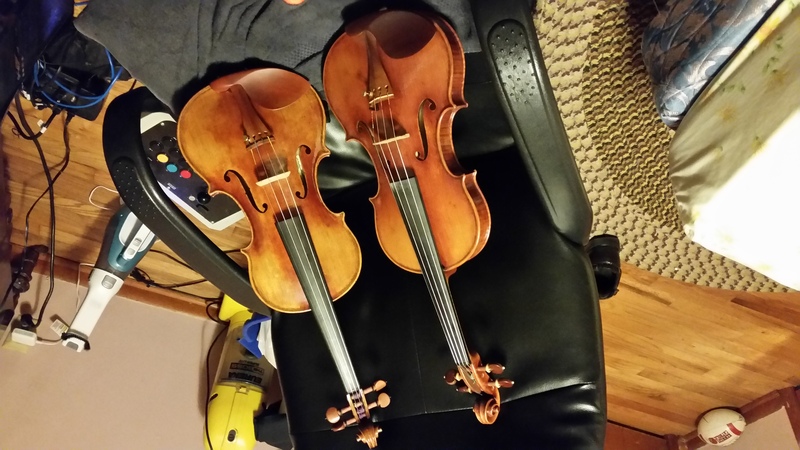 Attached is the picture of my new violin alongside the Ming Jiang Zhu 909, which will find a new loving home in short order. I'll be back soon with more impressions! Congratulations. Can't wait to hear it. It will be SO interesting over time, to hear your impression of how the sound "develops and changes" once it is played for untold hours - interesting, very interesting..... I'm sure you have an instrument there that is truly worthy of being "passed down through generations" - take good care of it and have it fully and properly insured !!!!!! You can never go wrong with your choice of instrument or accessories from FiddlerMan, no way. Bill is awaiting a retirement cheque to arrive - and I kind of already know where it will be going !!!! Cool ! @BillyG I know just what you mean about the Concert violin. I think if I hadn't taken lessons, it would have remained my main fiddle for longer than the short time it did, lol. I kept finding myself comparing it to hers, no matter how hard I tried not to. My teacher really likes both my violins, and has already declared the Concert my outdoor jamming fiddle, lol. Congrats on the new fiddle look forward to hearing you play it. Congratulations! It sure is a beauty! It will be SO interesting over time, to hear your impression of how the sound "develops and changes" once it is played for untold hours - interesting, very interesting..... I'm sure you have an instrument there that is truly worthy of being "passed down through generations" - take good care of it and have it fully and properly insured !!!!!! You can never go wrong with your choice of instrument or accessories from FiddlerMan, no way. Bill is awaiting a retirement cheque to arrive - and I kind of already know where it will be going !!!! Cool ! 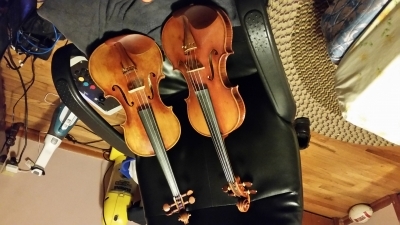 I know the "itch" that you describe ... this is the 6th or 7th violin I've owned, and as you said, I think I've found "the one". But even if I had all the money in the world, I wouldn't change the past one bit. In order for me to truly appreciate the Plowden, I need to have the experience of playing on all the instruments I had prior. Otherwise, how do you identify the traits that make it special? I think growing with--and outgrowing--a violin is a worthwhile experience. Once you get a new violin and appreciate the traits the violin has that you didn't have before, it keeps you motivated and yearning for more. This is crucial to the development of a good violinist in my opinion. If there is a trait on the Plowden that I can't get enough is the ease of playability. It takes no work to get a really pure rich sound out of it. This is so evident when I'm playing a sustained note (especially if it's the last note of a piece), and noticing how little bow I need to sustain the sound. The sweetness of the A string swoons me as well. Everyday I go to work and all I can think about is getting home and playing the violin some more. Tonight, I've played it for about 2 hours, and the D and G string are continually opening up .. It's an absolute joy breaking in the instrument. Yes, Fiddlerman is a god-send, and as I told him privately shortly after I got my violin, I will do my best to get the word out about Fiddlershop. It's an absolute joy to deal with an honest shop with awesome instruments at great prices, and it's online! oh.. how very very very exciting. 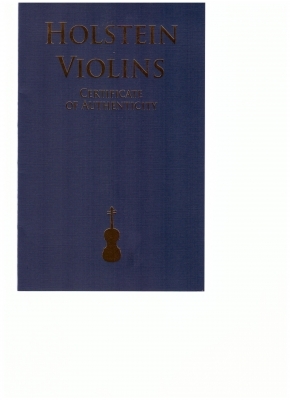 Thank you for the information and excitement of the new violin. I know the feeling of a very very good violin sounding better and so easy to make a tune. Very very early on I got to play my friends beautiful old violin that she has been playing with for 22 plus years... I got the bit of feeling and sound in my ear and in my blood. I think out playing a violin is a treat... I relish all my days on my violins... two years on a concert.. 1.5 on my Soloist and now my Ming. My next quest... over the next year is to get my "forever" bow. I want a good wood bow. Update #2: It's been a little over a month with the new Plowden and suffice it to say, I've ran out of adjectives expressing my happiness with this instrument. Whoever this maker is, has a remarkable gift and it's quite an honor to experience this gift. I never have played on such a violin before. The ease of playability, the tone, heck even the varnish still gives me goosebumps. Beautiful. You're very lucky, it sounds like a wonderful instrument. It sounds like it's a wonderful instrument. It's so rare these days when we find we've made a good deal for our money. 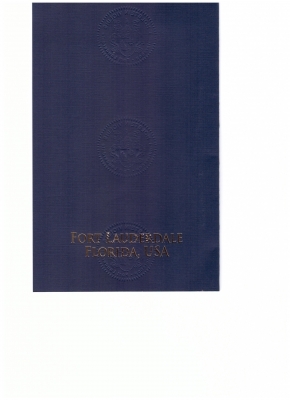 I almost forgot to put up the COA I recently got for the Plowden. Hats off to the Holstein family for doing a bang-up job on producing a truly professional looking certificate. See below! P.S. In just the past few days, it has opened up even more and now I just have this 'disbelief' look on my face when I watch myself play in the mirror (haha .. it's not for vanity, I'm working on improving my bow arm). It's good to have in case it gets stolen. For insurance purposes and police reports.